Chocolate Chick Pea Calzoni aka Calzoni di Ceci is a special southern Italian treat, made during the Christmas period. 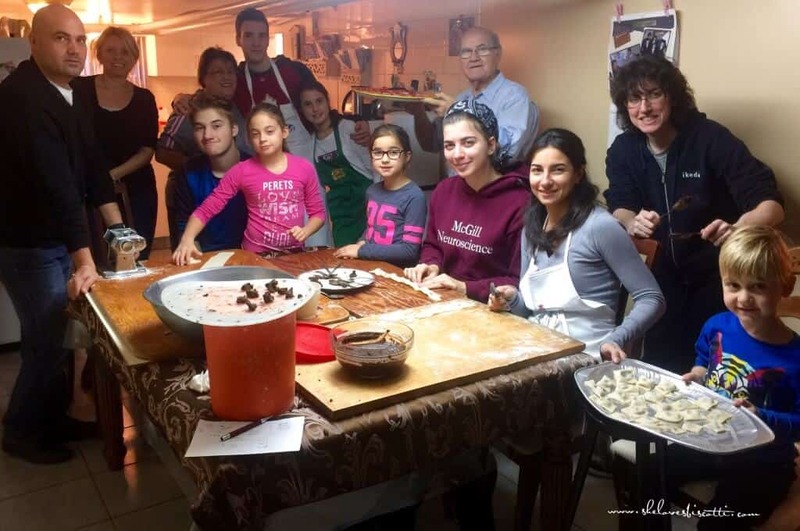 This particular holiday tradition, which has its roots in Muro Lucano (my husband’s home city! ), keeps the spirit of Italy alive and cherished in Montreal. Following the passing of my mom, I think I finally understood and truly appreciated the importance of keeping family traditions alive. Traditions are not just around to provide us with a link to the past; they are vehicles for eliciting and re-enacting special memories of time spent with loved ones. My sister-in-law called me last Friday evening with an invitation I could not refuse. She was planning to make her calzoni. The filling was to be made on Saturday and the montage of the calzones on Sunday. Thank goodness for her persistence! The wheels were set in motion… I was super excited! That evening as I feel asleep, my last thoughts were of chocolate covered chickpeas (ceci is chickpea in Italian)… sweet dreams indeed! My sister-in-law was already up and waiting for me the next morning. She informed me that her daughter would also be participating in this event. I was super charged and super excited! We began gathering the ingredients and in walked my lovely niece, along with one of her sons. As we weighed and mesured and discussed all the ingredients that went into the filling, the doorbell rang and in walked yet another relative, not to make calzoni, but just passing by to give his best wishes for Christmas. At that particular moment, it was as though I had a vision of Christmas past. I remember family and friends dropping by my parents’ house just to have an espresso and whatever my mom was pulling out of the oven. The conversation was never hurried, it was always in the moment, like it was this Saturday morning. Today, the conversation had a tone of appreciation and respect… and I was reminded once again of all the effort our mothers and grandmothers made to have everyone gathered around the table, just enjoying a simple conversation and simple food. It really was beginning to feel like Christmas. Making the filling was a relatively short process so I left Angelina’s house with the intention of making my own version of the filling as soon as I got home, incorporating some ideas I wanted to try out. 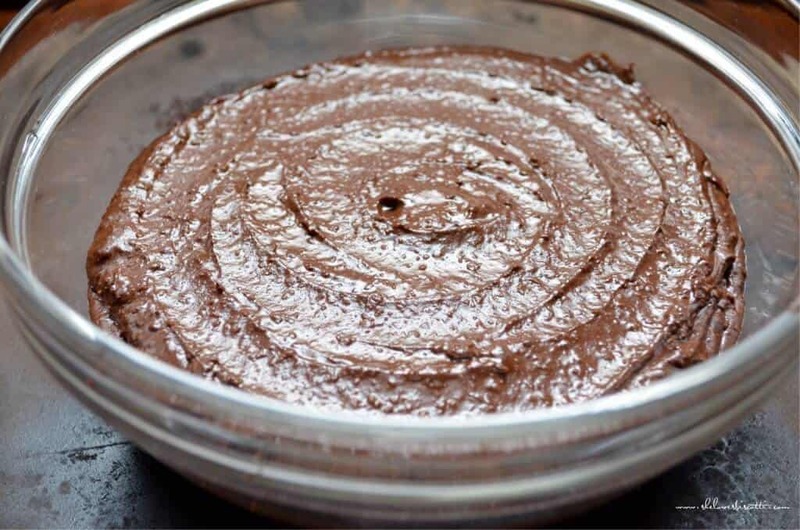 Unlike my sister-in-law, for instance, I was going to use my handy food processor to blenderize all of the ingredients together, in order to obtain a filling with a silky, chocolaty, smooth consistency. The next morning, I had a rendez-vous at Angelina’s house to complete the process. My daughter wanted to come too. And so, early Sunday morning, off we went! The first order of the day was getting my sister-in-law’s approval for the little modifications I made to the filling. Essentially, I used only rum (she used a combination of rum, and whatever other liquor she had on hand). I added a pinch of salt and a tiny bit of lemon juice; and I used a food processor to blenderize everything together instead of using a food mill. (Note to self: I will add a little cinnamon next year). Once it passed the taste test, we began weighing the ingredients for the dough. Five minutes after I walked in the door, my niece, Angelina’s daughter, came in yet again through the back door, this time with two of her sons by her side and armed with her stand mixer. 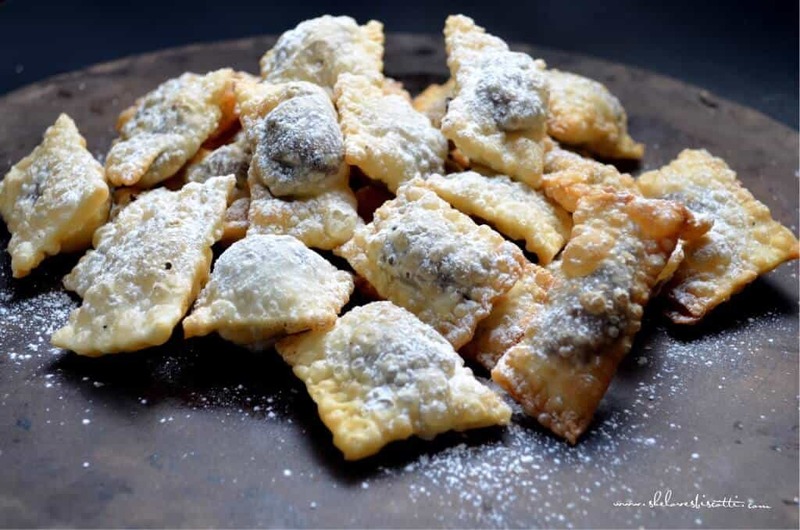 It had been established during the conversation from the day before that we were going to bring these Chocolate Chick Pea Calzoni aka Calzoni di Ceci, into the 21st century. 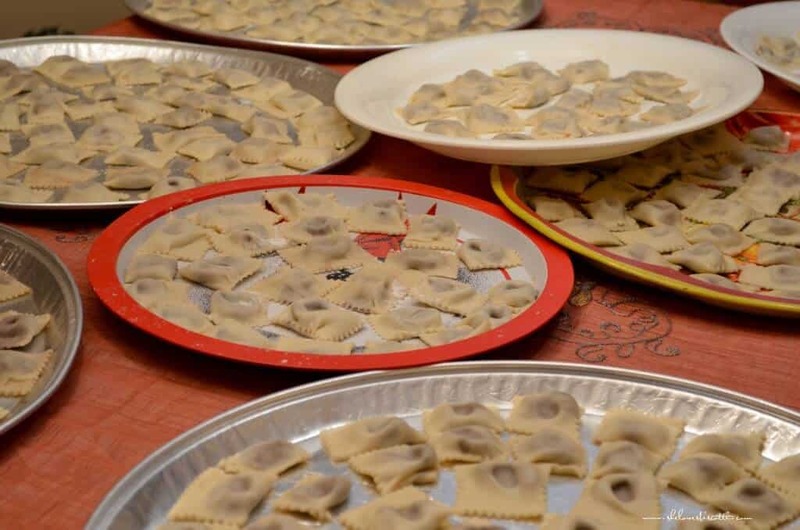 We had a lot of calzoni to make – and when I say alot, I mean approximately 700 – this is some serious calzoni making! Instead of kneading the dough by hand, we were going to use the stand mixer. The dough comes together in no time at all. Once you measure out the flour, you add equal amounts of oil, white wine and water. That’s it. We let the dough sit for at least 30 minutes, and in the meanwhile, we prepared the work stations. During this preparation, more reinforcements walked in through the door. This time they took on the shape of Angelina’s daughter-in-law (armed with Tim Horton’s coffee! ), and three of her small grandchildren. After some quick catching up, we returned to the business of making the calzoni. My sister-in-law showed us the pastry cutter with which her great-grandmother Felicia used to make the same calzoni di ceci over 100 years ago. She only takes it out of storage to make these little gems. 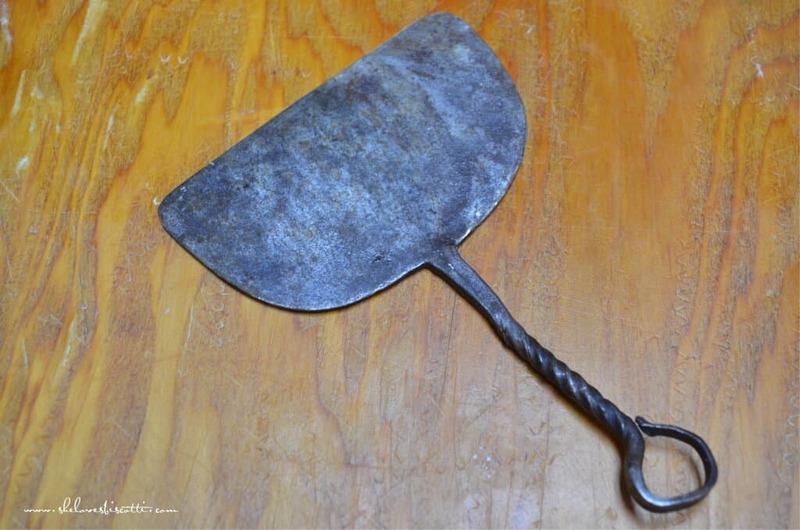 We nicknamed this rustic pastry cutter Felicia. In the process, another generation learned of pastry cutting techniques of a hundred years ago. At this point, the dough needed to be rolled out. You can use a rolling pin, but we used a pasta roller. I used my Kitchen Aid Pasta Roller and Cutter Set when I made them at home later that week. Start at level 1 and work your way up to level 4. The higher the number, the thinner the dough. We are half way through this process and thank goodness, the reinforcements just keep coming, this time they were in the form of one of Angelina’s sons, his wife, and his daughter. Of course, Angelina’s husband was also around, which means that at this point, we reached a total of 14 people, making calzoni together. The more the merrier, that’s what I say! At this point, it’s just a matter of filling them up, covering them with another sheet of dough. …and repeat the whole process, a couple of hundred times. For a moment I thought of the chocolate scene from I Love Lucy. 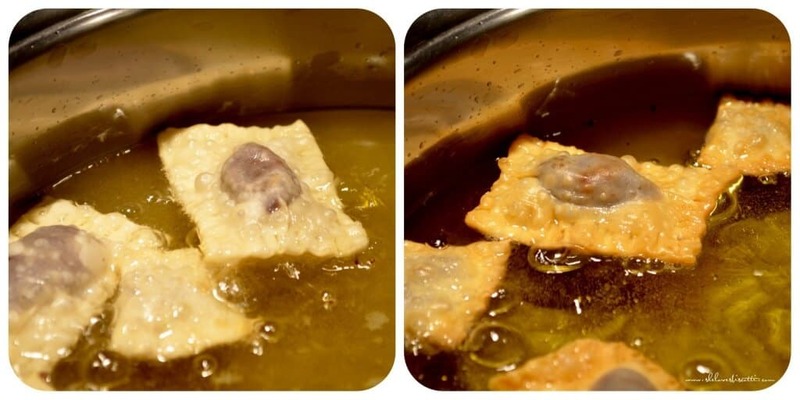 It’s important not to have any air bubbles inside the wrapper as this might cause the wrapper to open allowing the filling to escape into the oil (when deep frying) and making a mess. Oh, and you need to make a little indentation on the top. Here is the quick dip in the fryer. Yes, I know. If you know me you know that I am not a fan of frying, but this is once a year and it’s tradition! A couple of minutes in the fryer and they are done. Just before serving you can sprinkle your calzoni di ceci with either icing sugar or granulated sugar. The dough is super crisp, not soggy at all. It reminds me of a thinner version of the shell of an egg roll. As I have previously mentioned, this recipe has it’s origin from Muro Lucano, in the Italian region of Basilicata, in the province of Potenza. A truly beautiful area of Italy. That is where my husband and his family grew up before immigrating to Montreal. I had an absolutely magical weekend making these Chocolate Chick Pea Calzoni aka Calzoni di Ceci… after all this is what Christmas is all about, spending time with the ones that mean the most to you! Wishing all of you a very Merry Christmas, a Joyeux Noel and magical moments with the ones that you love! 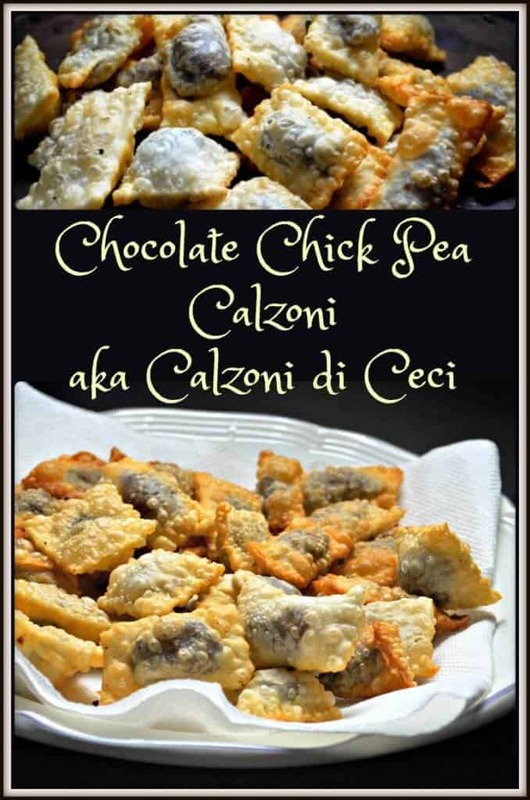 This recipe for Chocolate Chick Pea Calzoni aka Calzoni di Ceci is a Christmas treat originating from Muro Lucano. The filling includes chick peas, cocoa powder & rum. Fill a medium saucepan with some water. Rinse the chickpeas and place in the water. Turn on heat to medium and allow the peas to get warm. In the meanwhile, combine the rest of the ingredients for the filling in a food processor. Add the chick peas and blend until smooth. Place in a bowl, cover and refrigerate overnight allowing the flavors to blend. In a large mixing bowl (of a stand mixer) with the dough hook attachment, add all the ingredients for the dough together and beat on medium speed until a ball of dough is formed. Place in bowl, cover with plastic wrap and let rest for at least 30 minutes. Using a pasta roller attachment. Cut off a small piece of dough and pass through the rollers at dial 1. Keep increasing the dial number until you reach level 4. strips of dough should be about 4 inches wide. 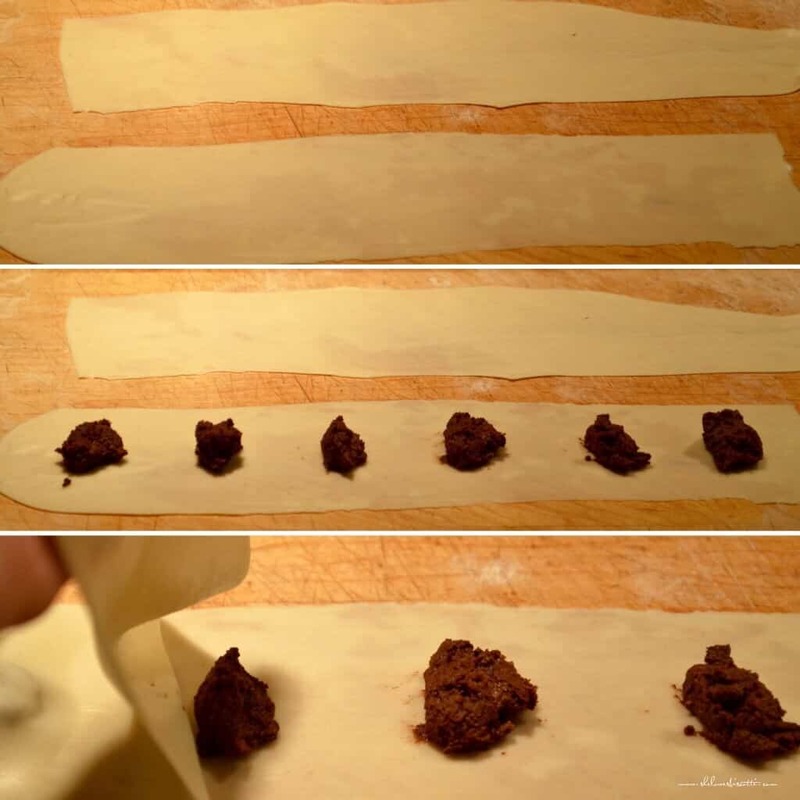 Once you have 2 pieces of dough, place about one teaspoon of filling in the center of one strip, about 1 inch apart. Place another sheet of dough over the top and gently press together. With a serrated cutter, form a free form rectangle. 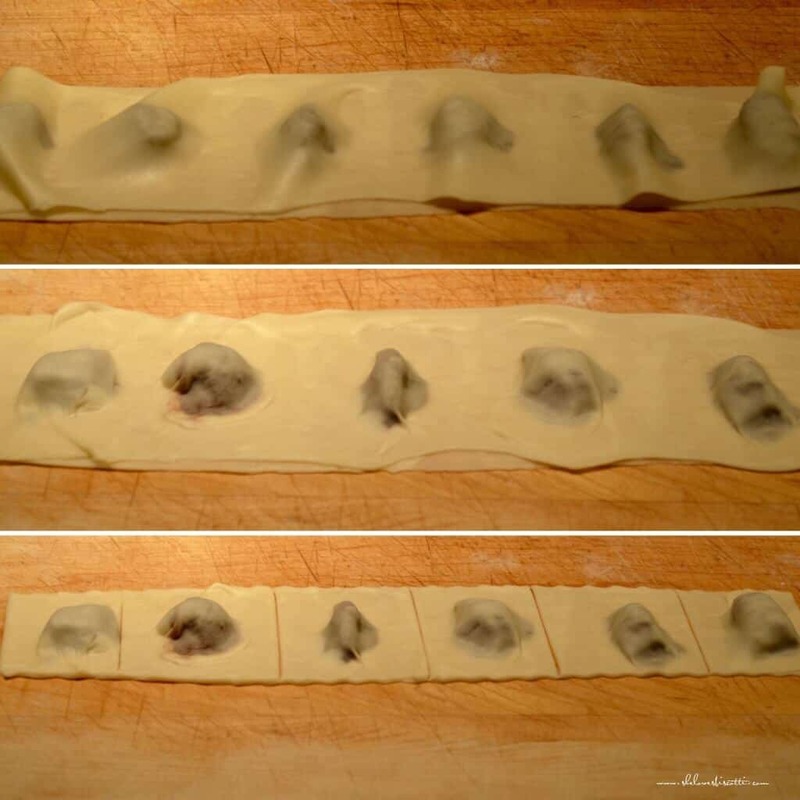 Continue making the calzoni using all the dough and filling. Heat oil in a large pan and drop a couple of calzoni at a time. When they rise to the top, turn them over for another minute or so. Remove with slotted spoon and place a paper-lined tray. When ready to serve, sprinkle with confectioners' or granulated sugar. Active prep time is approximately 4 hours. Since the filling needs to stay in the fridge for the flavors to blend, you can calculate the idle time to be at least 12 hours. The filling can be adapted to your own taste...Angelina adapted the recipe by eliminating cinnamon and adding nutella. I will try adding the cinnamon the next time I make them...do not think I will keep the addition of lemon juice...come back next year, when I will try yet another variation. My mother is from Muro Lucano too! Thank you for posting the recipe! No other Italians seem to know what this dessert is! Buon Natale! My 82 year old friend remembers her mother making these. She remembered a few ingredients, but couldn’t remember the entire recipe. I googled them and it brought me to this site. My friend was so happy when she saw the photo. Her mother used chocolate syrup in the filling, would do the first fry in oil, and a second fry in honey. Sounds and looks so delicious. What a wonderful recipe Maria especially since I love chickpeas! And I adore how you all got together to prepare them, such a great tradition to continue. I’ve never tasted these before but they’ve been on my to do list for years. Thanks for sharing this! Thanks so much Nadia! We had such a wonderful week-end making these fritters. These calzoni were also on my to do list for years… I’m glad my sister-in-law did not give up on me. Thanks for stopping by. Happy Holidays! I was born in Muro Lucano and immigrated with my mom to Montreal when I was 5 years old. I still have the fortune of having my mom make this wonderful dessert every Christmas and on other special occasions. We also drizzle the cauzune r’cic with u vine cuote, which is a must reduction made from unfermented grape juice. This wonderful syrup adds a little extra sweetness and moisture to this tasty dessert. My wife and I were in Muro just a few weeks ago visiting family and they prepared a big batch for us as a welcome dessert. Loved it! That sounds absolutely delicious! I must ask Angelina (my sister-in-law) about this. As you probably know, these calzoni are so good, they are usually the first Christmas treat to disappear! We visited Muro a few years ago… I fell in love with this part of Italy… wonderful people! I was just looking over my mother’s Christmas recipes and came across her calzoni di ceci. I make lots of other of the traditional Christmas recipes, but not these. 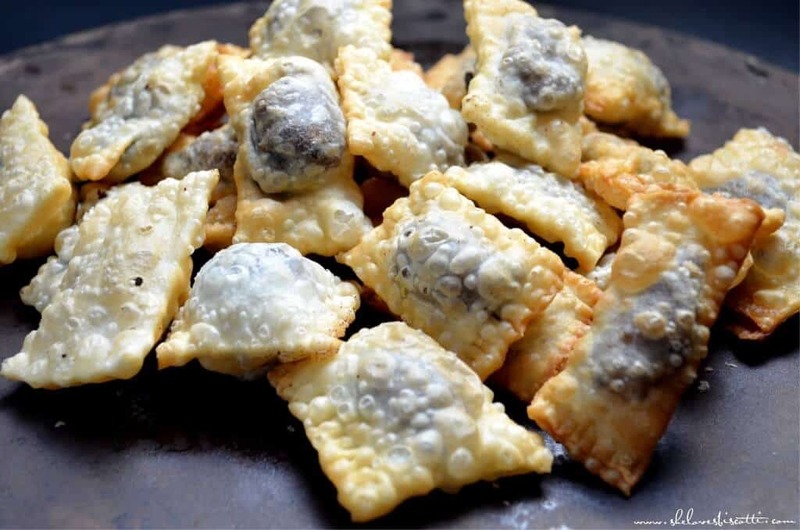 Her recipe was a bit different and she actually made them in small crescent shapes, but your idea sounds more practical as there is not so much left over dough to keep re-rolling. My mother came from Celenza Valfortore, a small town in the province of Foggia, Apulia. My pleasure Catherine. It was a fun day to make these calzone with all the kids. I love how every household has there own variation. My mom has a variation of these that she also shapes in a crescent like you. Thanks so much for taking the time to comment, appreciate it. It was wonderful and heart warming to the read this story. My parents came from Abruzzo and we always had pizzelle for festive occasions as well. 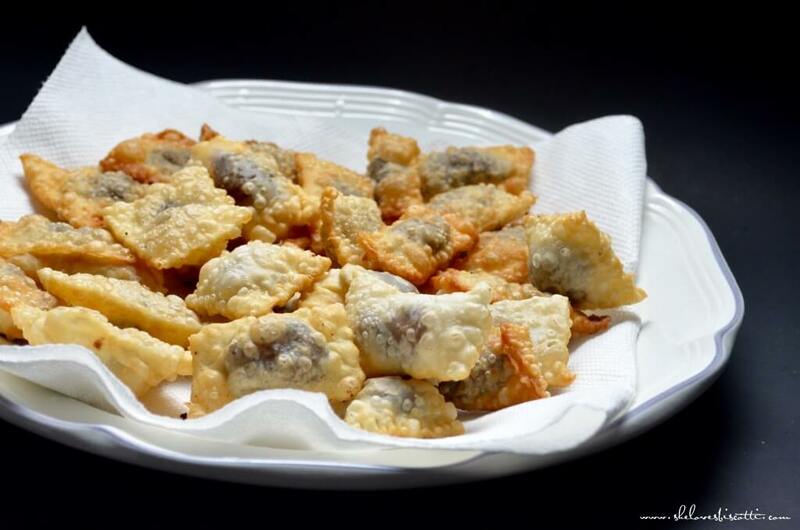 Mum also makes her local version of these fried treats and they are called Fritte Di ceci. Her family recipe has a light red wine added in the pastry and a little black currant jam in the filling for its sweetness. No coffee or Nutella and they are free form in shape. We all love these treats and at 90 she is still making them. I do like the look of yours too and will try them. 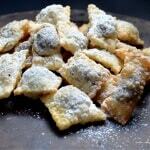 The Fritte di Ceci sound wonderful… I just love how every family personalized recipes. Maria, my mother has made these every Christmas. I started to help her over 8 years ago. As she is nearing 87 I have called in enforcement. First my niece and nephew. This year my daughter was off work so she joined us and also my cousin. A total of 6 we have stations set up. Mom sits at the table filling and shaping , my cousin helping her. My niece (13) runs the fryer, her brother (16) ran the fryer last year but he enjoys running the Kitchen Aid to roll the pasta out. 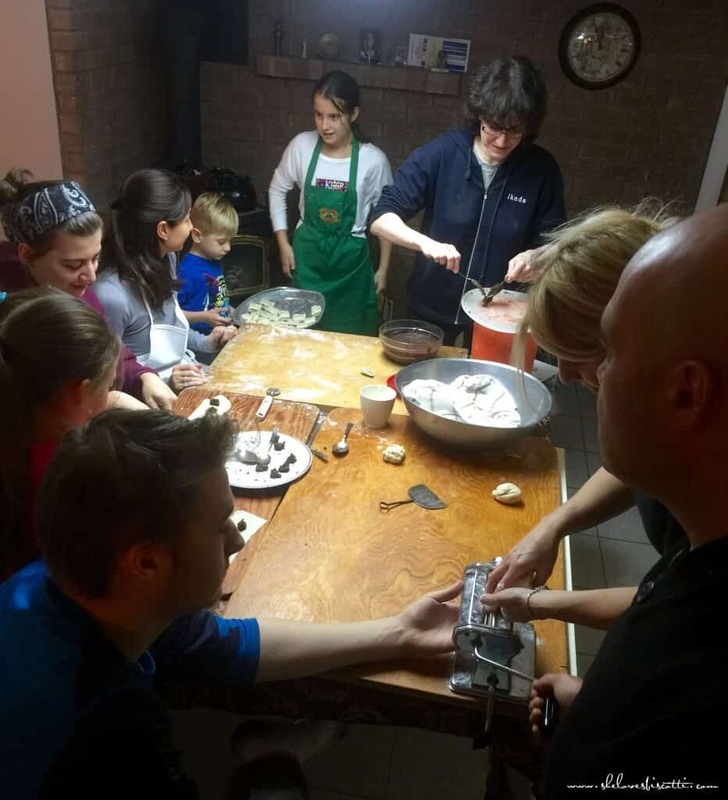 My daughter and I run between all, bringing the dough to Noni to fill and shape, taking to the fryer, placing on the brown paper to drain, and of course sprinkling with icing sugar.We have slight differences to your recipe. We use Chestnut puree and white wine, ground almonds and walnuts. We also call them Coujeannettes or I have seem them called Calginetti. I found your site by googling the difference of Biscotti and Cantucci. I am going to make your Anise Biscotti now. It’s never too late when food is involved 😉 It really was a fun day making these chick pea calzoni, especially with the antique rustic pastry cutter…such a privilege. Thank-you for taking the time to comment. Wow, well done! My parents are from Muro Lucano so these have been our tradition. My mom turned 80 last month so my 9 year old son wanted to learn this tradition. He woke up bright and early on Sunday to help. Viva i muresi? Una bella storia di Natale e proprio una bella ricetta ?? Buon Natale Maria e a tutta la famiglia! !